The Home School Alliance organized a Summer Opportunities Fair on February 12, 2016. Over 20 representatives from various organizations spoke to Workshop School students, discussing both paid and unpaid internships and experiences that are available to teens throughout the city. 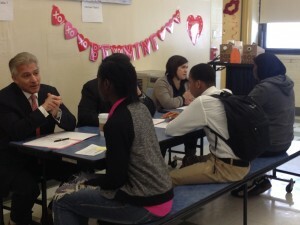 Furthermore, 8 HSA volunteers coached over 50 Workshop School students in mock-interviews that ran concurrent to the Opportunities Fair. 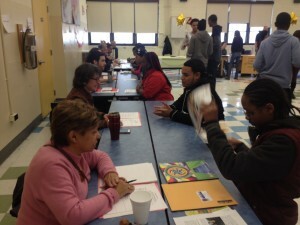 The volunteers wanted to give students feedback on their interviewing skills before stepping into an official interview. All of the representatives and volunteers were invited to an appreciation lunch after the event. We thank all of our partners for their time and energy, especially as we continue to assist students as they find summer employment and enrichment.